St Margaret’s Place, which is off Cannon Place was built in the 1820s and originally called Regency Cottages. 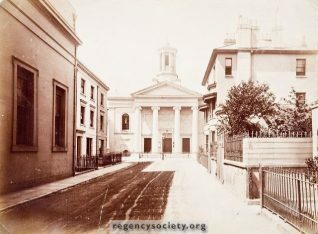 The name was changed when St Margaret’s Church was opened, at the end of the road, in 1824. The church was designed by Charles Busby for Barnard Gregory, the then editor of the Brighton Gazette. It was named after his wife Margaret, and at the time was considered to be the best classical church in Brighton. With a seating capacity of 1,500 persons, it was second only to St Peter’s Church. 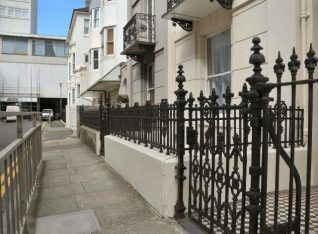 The houses, which have Ionic pilasters, and railings, at numbers 2-3 on the north side of Cannon Place, are listed and probably by Wilds and Busby. Opposite stands the very grand entrance to the former Royal Newburgh Assembly Rooms, by A.H.Wilds for Charles Wright, also listed, and erected c1833. The entrance facade has two Corinthian columns on either side of the doorway, with a central pediment. William IV is reputed to have attended the opening of the assembly rooms which were a popular social centre for many years. I think St Margaret’s was demolished in 1959 (perhaps somebody can confirm this) and replaced by Sussex Heights, the tall block of flats pictured behind the former Royal Newburgh Rooms. Can you understand why that beautiful building was demolished to make way for a hideous building, which, I believe, was originally intended to house the better off amongst us. I believe that St Margaret’s was at one time intended, after the end of its life as a church, to be the Brighton Local History Museum. 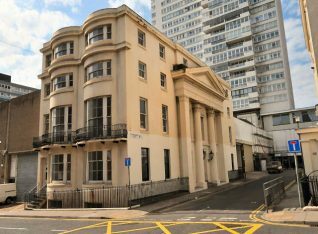 It was lost at a very low point in Brighton’s life when great damage was done to the urban fabric, not just in demolitions but in what replaced the older buildings. 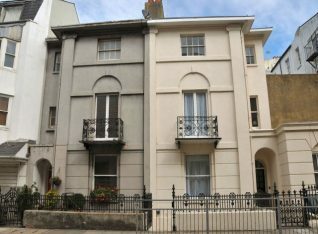 Very few structures of that time deserve merit, one being the small development of Brighton Square- it being in scale with the other streets of the Old Town. Suggestions for other success stories? Just seen this belatedly. The bulk of the 1875 3-manual organ in St Margaret’s by Gray & Davison was rescued at the last moment by Morgan & Smith, and deposited in the South Transept of St Andrew’s, Burgess Hill. Two or three of the best stops (Mixture and reed(s)) had been stolen by then, but nevertheless the organ was eventually rebuilt in St Andrew’s as a 2-manual, by F.H. Browne, where it flourishes to this day. Just found a report in the The Times (31 July 1958) that indicates St Margaret’s was going to be used to house the costume museum that, after a temporary stay at the Pavilion, ended up in the Bath Assembly Rooms and is now the Fashion Musuem – a huge tourist draw. So that’s a double loss to the city. Does anyone know why the former Royal Newburgh Rooms, which used to be used as a French and German protestant church, are now lying empty?